White chiffon angel wings on a wire frame trimmed with silver. 18" high. This pair of wings slip over your arms. They have elastic straps that go on the top of your arm. It is kinda like wearing a back pack! 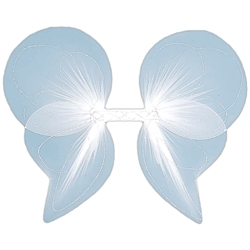 These white chiffon angel wings are a great addition to any angel costume.